Loon Mountain is definitely in the top tier of NH mountains. Perfect for family vacations, weekend warriors, and diehard skiers. Loon offers enough variety to keep almost any skier excited and coming back: from the steeps on North Peak (and South Mountain - Ripsaw, Jobber, Twitcher), the wide open groomers on the Main Mountain & Kancamagus side (known as the Kanc)Lower Picked Rock, Rampasture, Blue Ox. Also, don't miss the old school hand cut trails (Upper/ Lower Speak Easy & Upper Picked Rick) on the Kanc side. For the expert skiers out there you will get your heart pumping as you fly down Upper/ Lower Walking Boss & Upper/ Lower Flume. And don't forget the trees - when the lines get long and the snow is deep it's time to head into the woods. 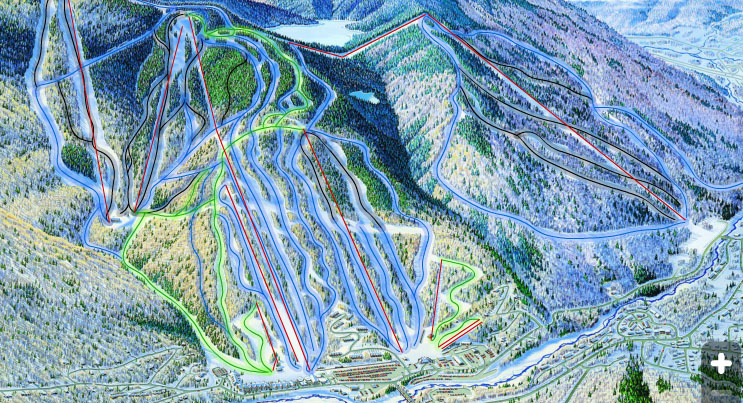 Loon offers a variety of hand cut and natural glades accessed from North Peak (Haul Back, cat track to Sunset, and Walking Boss) and South Mountain (accessed under the lift).